My neighbors’ daughter recently found out that she has to follow a gluten-free diet for health reasons. I’ve never baked gluten-free desserts before so she has inspired me to expand my horizons. I have a tall order to fill to impress an amazing 8 year old girl! 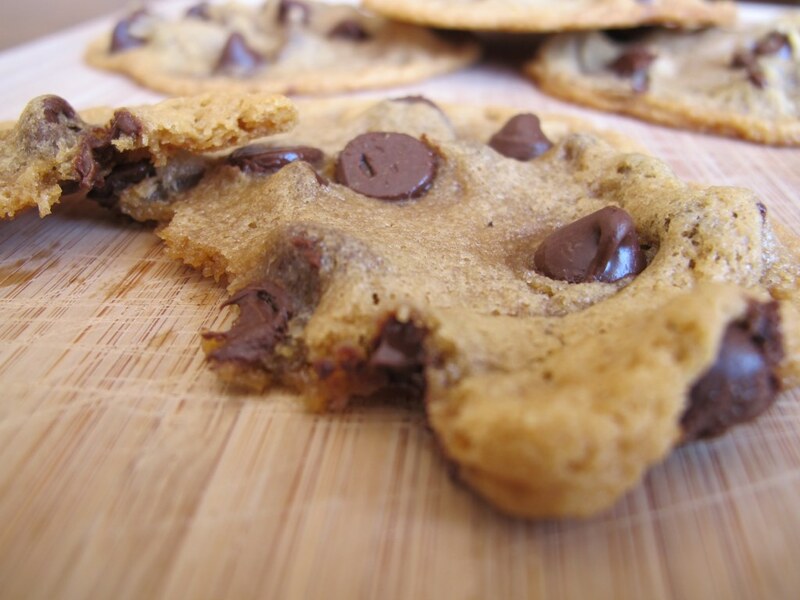 These peanut butter chocolate chip cookies are really the quintessential representation of chocolate and peanut butter but in a gluten-free and flour-free way! * I do not recommend using natural or organic peanut butter because they contain a high amount of oil which can ruin the texture of these cookies. In a large bowl, mix the peanut butter, sugar, egg, and vanilla extract until well combined. Add the baking soda and mix well. Roll the cookie dough into balls and place on a greased cookie sheet. Slightly flatten the ball mounds to allow them to bake evenly. Bake for 8 to 10 minutes or until the top and edges are barely set. It is preferable that they are slightly under baked in the center becaue the cookies will firm up as they cool, so baking them too long could result in hard cookies. Let the cookies cool on the baking sheet for about 5 minutes and then transfer them to a rack to cool completely. Store the cookies in an airtight container or in the freezer for up to 2 to 3 months. Have you ever felt like you’re glad that you’re head is attached to your body or else you would forget that?! I guess I was just having one of those days because I forgot to take pictures of my baking process for these great gluten-free peanut butter chocolate chip cookies! Peanut butter? What was that!? Chocolate? Where is that?! The power of that combo…let’s go with that. 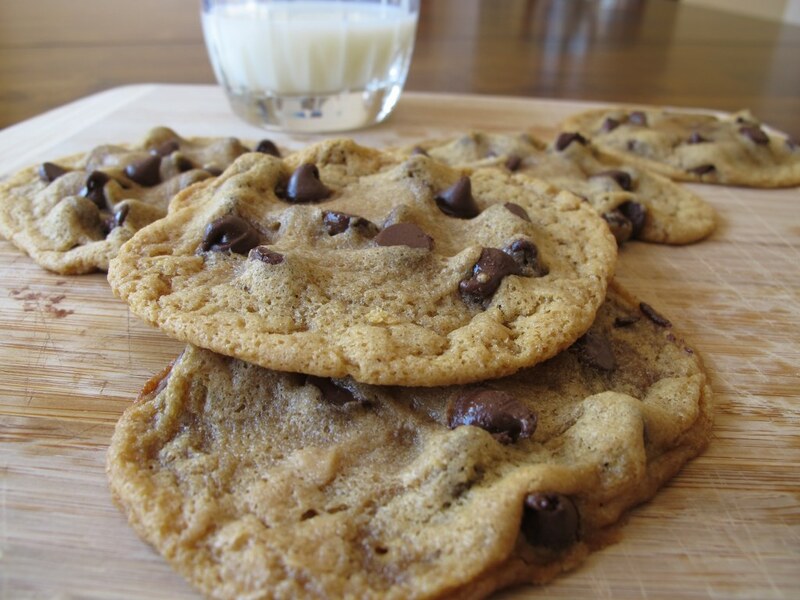 Well thank goodness these cookies are easy to make and the recipe speaks for itself! I love that I already had all the ingredients when I found this recipe and I could jump right into baking them! Not only am I impatient but I really strive to find recipes that don’t require a special trip to the grocery store. Many gluten-free recipes use gluten-free substitute ingredients, and while I do want to experiment with those at some point, I wanted to try a flour-less recipe first. Hello melt-y chocolate! 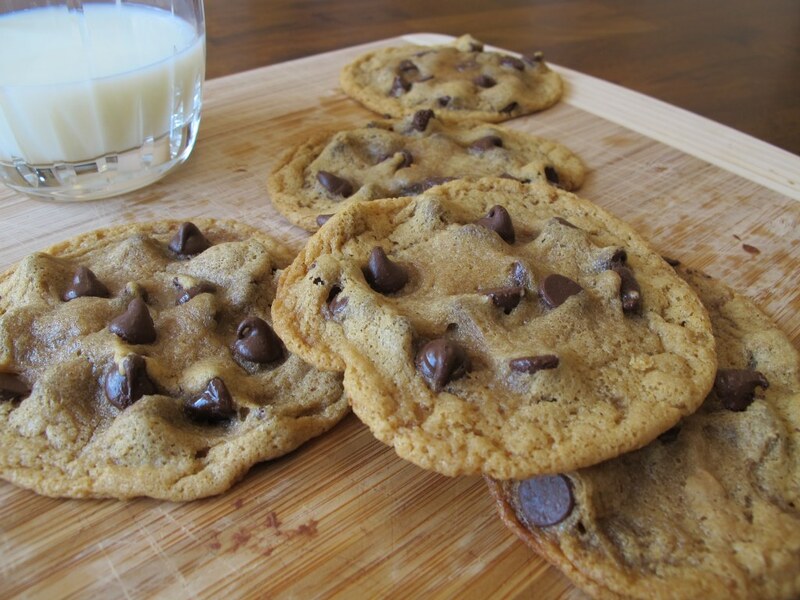 I just love cookies when they’re right out of the oven! 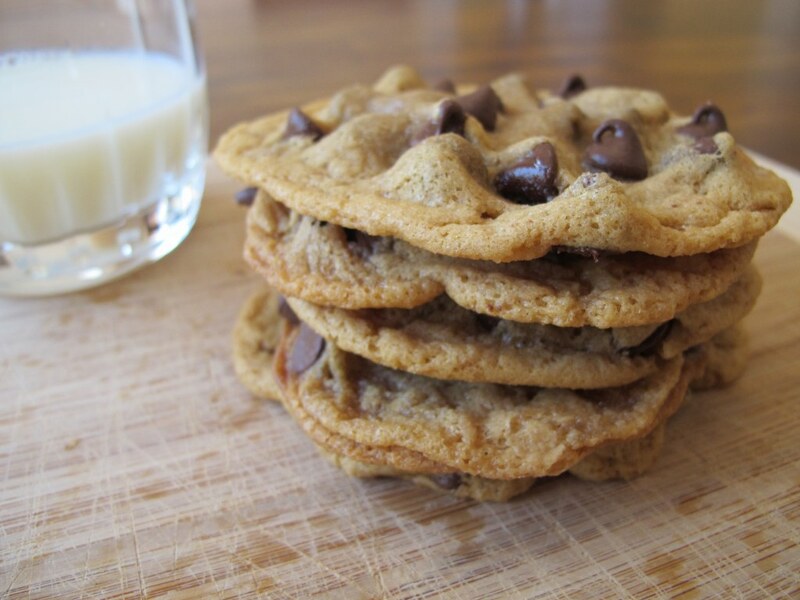 These cookies are thin, chewy, and packed with flavor! If you did a blind tasting of these cookies you would have no problem guessing what kind of cookie it is. Peanut butter! Bam! Chocolate! Bam! 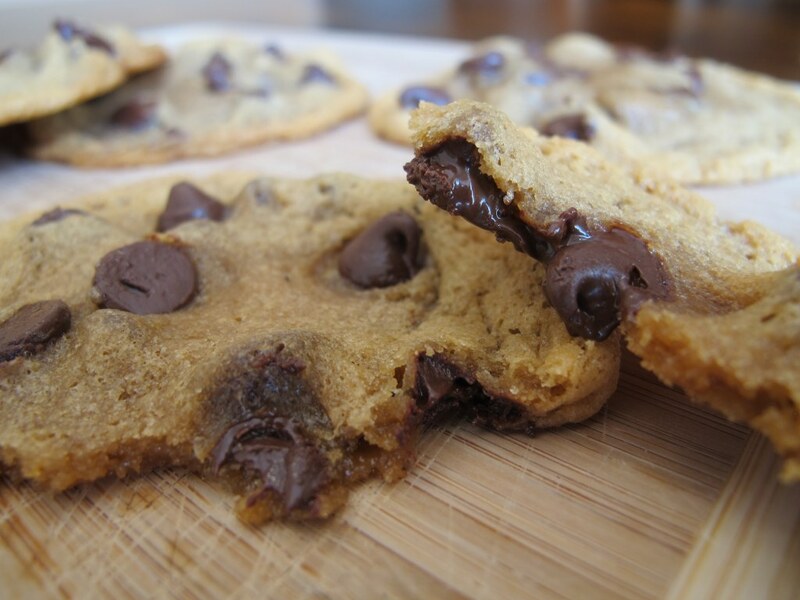 Their wonderful dense texture makes these cookies hearty and delicious. Note: I rated this cookie recipe as compared to other gluten-free, flour-less goodies that I’ve eaten in order to have have an apples to apples comparison. Thanks Averie at Averie Cooks for a great gluten-free cookie! I seriously love this cookie recipe! Delish! Hard to go wrong with peanut butter and chocolate! Thanks for trying these and linking up! Glad the neighbors and their daughter loved them!